Rising at the base of Tell es-Sultan (OT Jericho), Palestine, is a spring. It is a source of life in the moon-like landscape of the Lower Jordan Valley. Today, the water is used chiefly for agricultural purposes, but in antiquity it provided drinking water for those living in this parched oasis. It is another head-scratching example of Elisha’s wonder-working power. The phrase “Elisha’s Spring” or “The Prophet’s Spring” is still used today to describe this copious flow. You can see the spring house if you look east from the top of the mound. It is a elongated building with a red tiled roof just across the road. 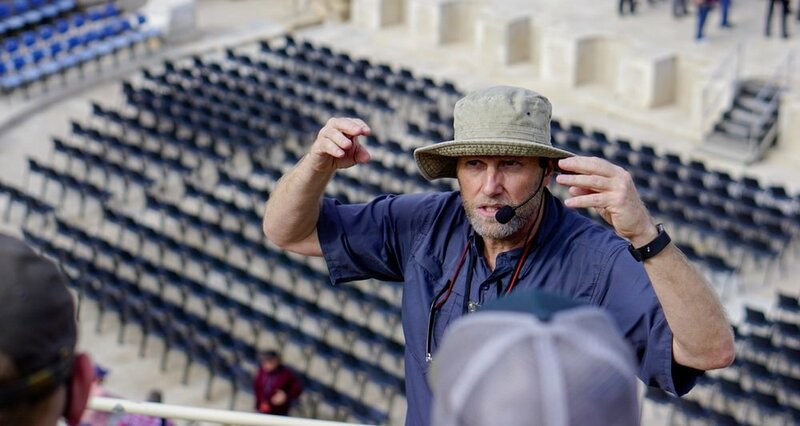 Interested in crafting an adventure of your own in the Land of the Bible? We work with church pastors, administrators, and college professors to customize trips to meet specific educational/ministerial needs. Shoot me a note at markziese@gmail.com to discuss possibilities or consider joining one of our planned excursions listed here. I can’t remember ever seeing Tell es-Sultan so green. Winter rain has given new life to dry places, even down in the Lower Jordan Valley. 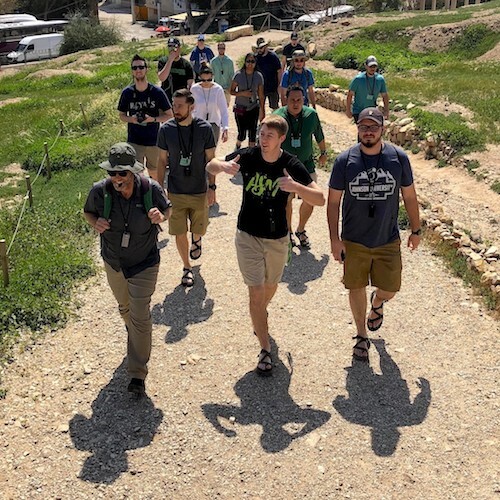 This image by Bible Land Explorer Seth Tinkler shows our group of Johnson University students ascending the trail to the top of the ruin-mound. From that spot, a great views were enjoyed to the Wilderness of Judea, the gnarled basin of the Great Rift, the distant rim of Transjordan, and the modern city of Jericho. Jericho prides itself in being the the most low-down city on the planet. Ringing in at 850 feet below sea level, they may have a claim. An experience of this land is incomplete without a shawarma. The centerpiece of this Middle Eastern “taco” is thinly-cut meat stacked and roasted on a vertical spit. 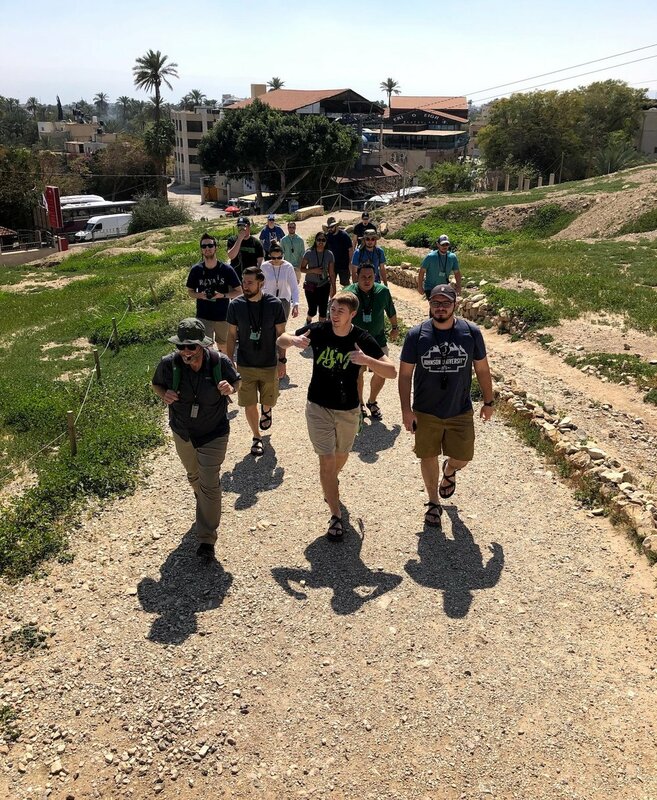 If you’d like to join us on an adventure of your own in the Land of the Bible, recognize that there are openings for trips departing this summer. Shoot me a note at markziese@gmail.com or check our full list of opportunities here.
. . . is the first word that comes to mind when I think about the ministerial students in Johnson University’s residency program. We have had three days of drenching rain in the Heartland (it really poured in Nazareth! ), but they have scampered over every rock and puddle and have not flinched. Other words that describe this group? Excited, compassionate, faithful, dangerous . . .
Tomorrow’s forecast for the Church is bright and sunny. Rain moves across the Sea of Galilee. Spent a few hours in the Church of the Nativity in Bethlehem yesterday. The restoration (which is not quite yet complete) is simply stunning. Those who can remember the dark dingy nave of yesteryear will be astounded to see the place today. The new roof is rustic but beautiful. You can see the open rafters of cedar that were hewn and hoisted into positioned in the 14th century. The 44 columns that support that roof were cut from local limestone and polished to a high degree. Now that they’ve been cleaned, you can distinguish them from their white marble crowns decorated in acanthus leaves. Note the scrollwork in the architrave that spans the gaps between the columns. Keep in mind that this structure has been continually used as a place of Christian worship since the time of Constantine (mid 4th century). That makes it unique in all of Israel-Palestine. The outline of the present structure was established by Justinian I in the mid-6th century. The Church of the Nativity in Bethlehem was erected over a cave where Jesus was born. It was the first place in Palestine to be recognized by UNESCO as a World Heritage Site. The Church of the Nativity is hopping right now as the tourist season is in full bloom. We have openings right now for a trips scheduled to depart this summer. Write me at markziese@gmail.com for more information or check our full list of study-travel opportunities here. 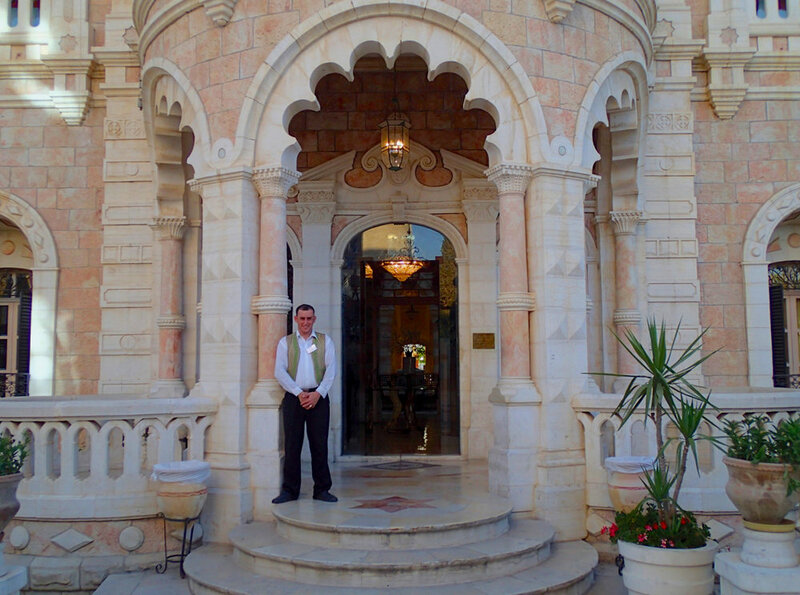 News travels fast in Beit Sahour. I received a message yesterday asking if I had arrived in-country. Within an hour this young man was sitting outside my hotel with a car and an evening invite. I know his extended family well. They have been dear friends of ours for more than a decade. On the way to his place we stopped at this circle. Michael wanted me to see the statuary in the center honoring the Christmas shepherds. He and his team of Palestinian Boy Scouts collected the funds to make the display possible. 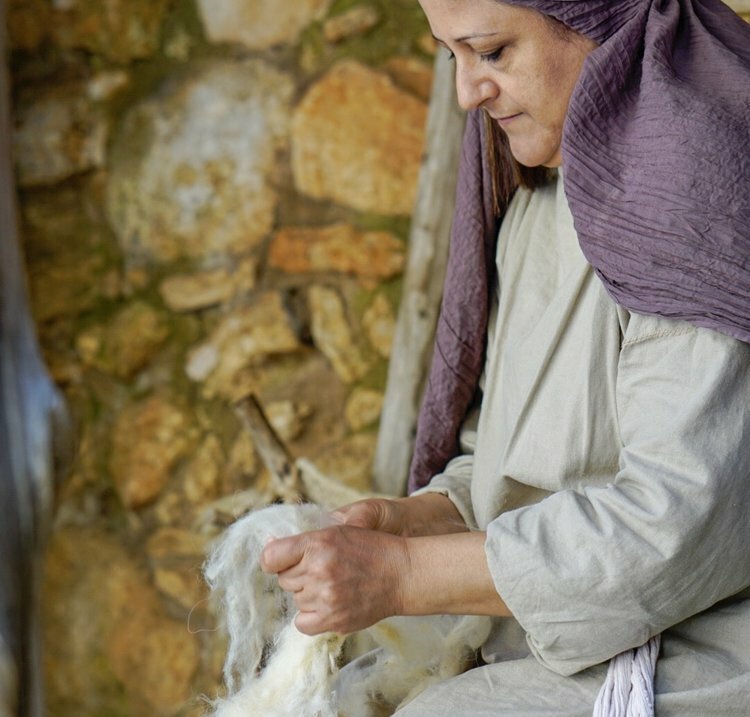 Beit Sahour is a Christian village and home to the memory of the nativity shepherds. It is located just east and downslope from Bethlehem. Today I meet a group of resident ministry students in the graduate program of Johnson University at the Tel Aviv airport. 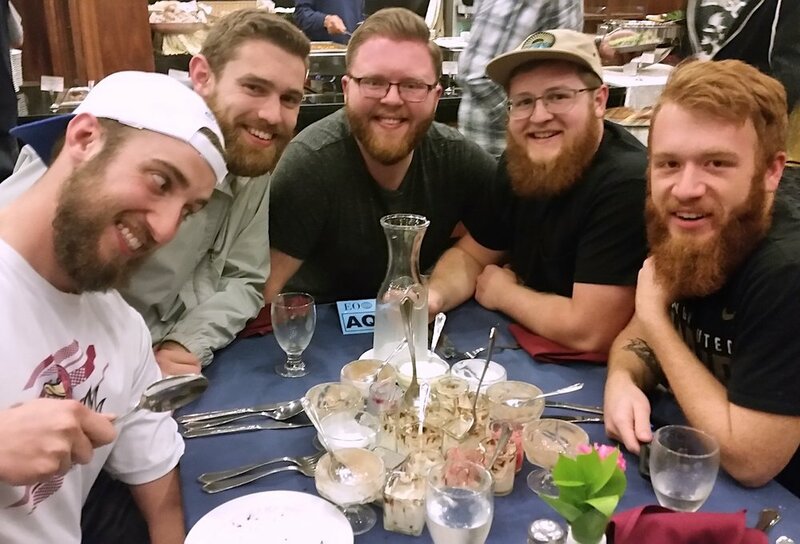 I am looking forward to spending the next two weeks with them visiting sites and regions of biblical relevance. You too are welcome to join us on a future trip. Write me at markziese@gmail.com for more information or check our full list of study-travel opportunities here. If you try one, you’ll know why you need to buy the box. 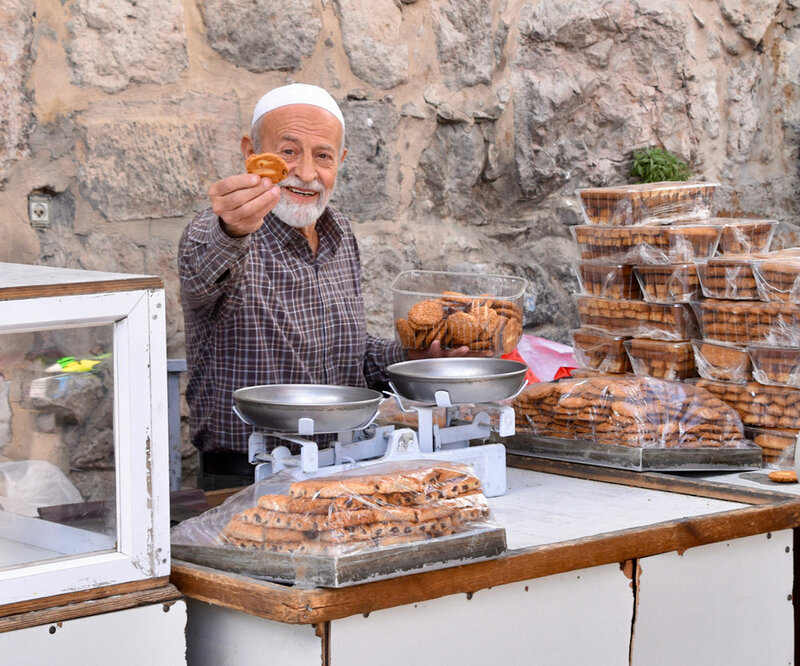 Arab hospitality meets shrewd salesmanship in East Jerusalem. There’s a fine line between the two. Bartering, bantering, coffee, and more bartering can be a part of the shopping experience. Bring cash and know your exchange rate if you are going to play the game. Smile regularly. Photograph by Bible Lands Explorer Mark Kitts. Standing on the hillside village of Mashhad, you feel the sprawl of Kfar Kanna in the distance. Kfar Cana had less than 1,000 residents at the end of the 19th century. Today that population has swelled to more than 20,000. A Christian core still exists. They are quick to point to a biblical memory. Kfar Kanna is famously associated with the first of the recorded miracles of Jesus, the Wedding Miracle of Cana, or the exchange of water to wine (John 2:1-12). 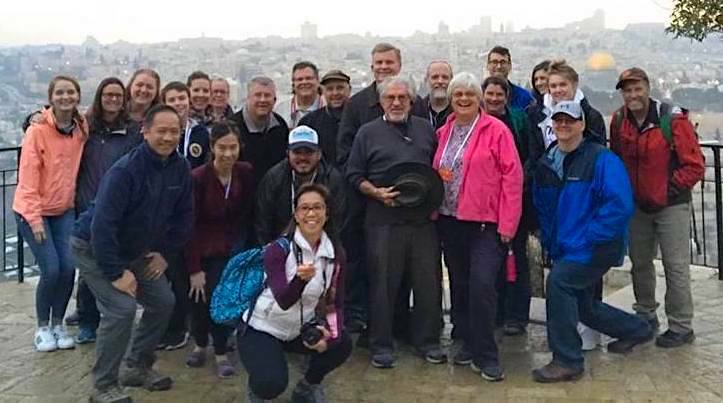 To this day, many tourists (and some Jesus Trail walkers) visit the Franciscan Wedding Church in the center of the village and purchase a bottle of wedding wine in one of the nearby stores. Despite this lingering memory, most archaeologists prefer to locate the Cana of Jesus’s day at the more remote site of Khirbet Kanna. It is several miles from here (on the other side of the valley) and difficult to reach. Bot Kfar Kanna and Khirbet Kanna rest to the north of Nazareth in the hills of Lower Galilee. I came across this image yesterday afternoon. It brought back some fond memories. It was shot in early March almost twenty years ago. 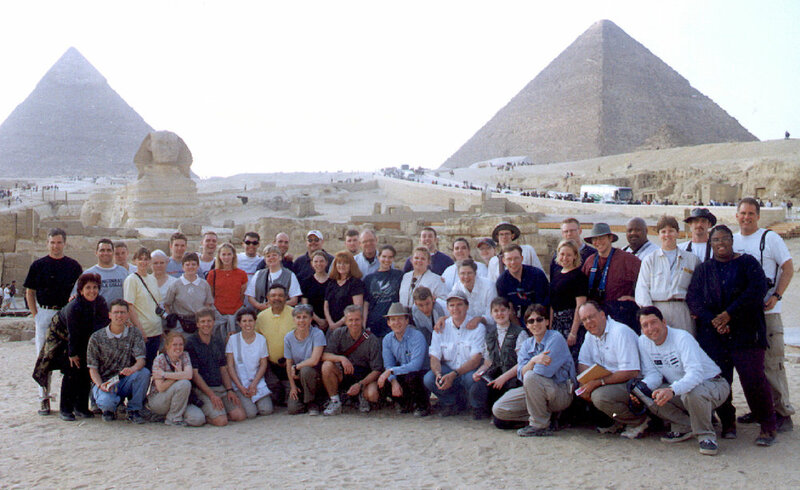 The place was Giza, Egypt. The faces are those of students and staff from the Cincinnati Christian University. These brave souls signed on for one of our most ambitious study-tours ever. Three countries in 14 days! Wowzer. But we filled every seat on the bus. If you were a part of this trip, I’d love to hear from you. 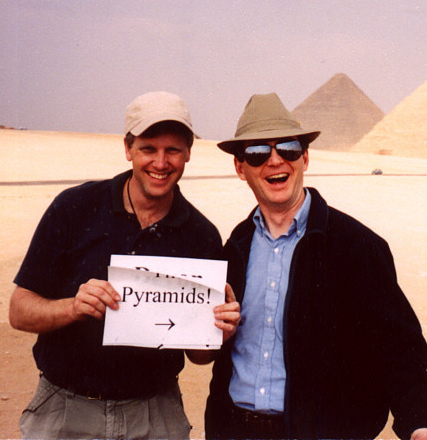 Care to share any photographs of your experience for other Bible Land Explorers? I can post them here. What memories does this image bring back for you? These two young fellers were among the leaders of the trip pictured above. Funny, they haven’t changed a bit! A few years have passed since 2000 but we are still up to old tricks. In March of 2019 we’ll be headed back to Israel/Palestine. This time we’ll have a student group from Johnson University in tow. Henry Baker Tristram was a pastor-ornithologist (interesting combination!) who traveled through the Heartland of the Biblical World in 1858, 1863, and 1872. His interests in the natural world prompted several books on the land including The Great Sahara (1860), The Land of Israel, a Journey of Travels in Palestine, Undertaken with Special Reference to its Physical Character (1865), and The Natural History of the Bible (1867). 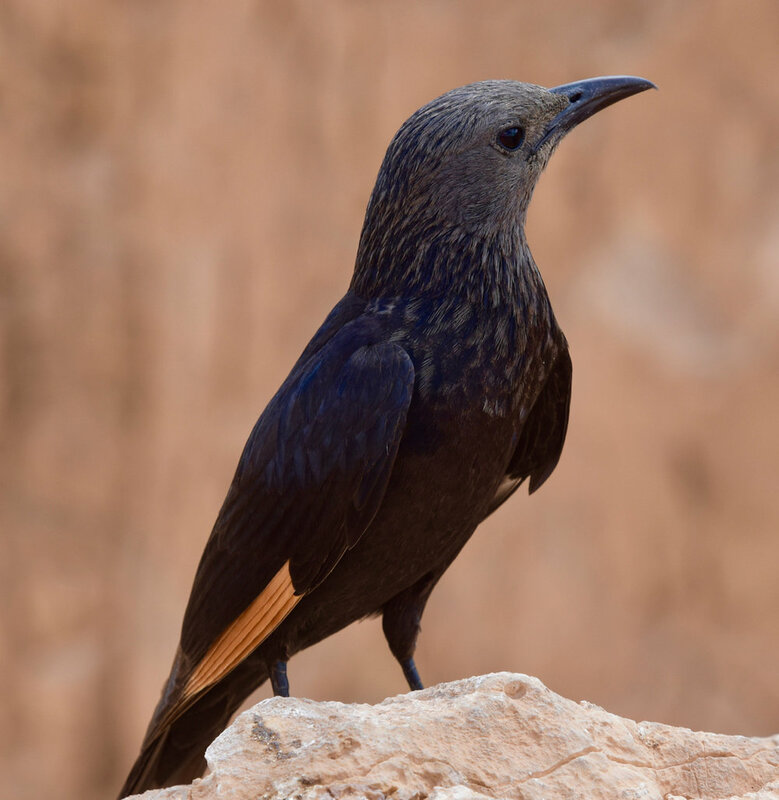 Several birds are named after him including the starling (or grackle) pictured above. One variety of the gerbil also carries his name. He was an early adopter of Darwinian evolution and attempted to reconcile ideas of evolution and creation. Later in life he rejected Darwin’s theories. This fine image was captured at the site of Masada by Bible Lands Explorer Mark Kitts. For a previous post of a remarkable bird and its discoverer see here.